This is a cookbook to share with your children. I am passionate about ‘real food’, simple, unpretentious homegrown, home-cooked food to prepare and share with my children. Cooking is creative, and can be exciting, stimulating and fun whilst helping kids develop an appreciation for and love of good food. Kids learn that real food, grown and cooked with love can be delicious as well as nutritious! The recipes are designed for parents and kids of all ages to share, starting with the simplest recipes and progressing to the more complex. Cooking is also a great way for parents and kids to share a meaningful experience, whilst also providing a perfect opportunity to experiment and develop skills important for healthy development. 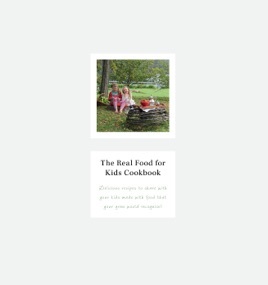 The emphasis of The Real Food for Kids Cookbook is on simple recipes that are easy to follow, packed with flavour and that incorporate lots of fun techniques to entertain the kids and keep them engaged. Cooking will only remain a cool activity if the kids are having fun and the food is delicious! Incorporating traditional methods of food preparation is also a core element of the cookbook - they are much more tactile and inject and element of fund into the whole cooking experience. And yes, fortunately (or unfortunately depending on your perspective) that means sticky hands and faces and plenty of mess in the kitchen - in other words kids heaven!